The Costa SwitchBack Backup from Thyrm LLC is a grip enhancement device intended for use with tactical versions of the SureFire EB1 and EB2 Backup. 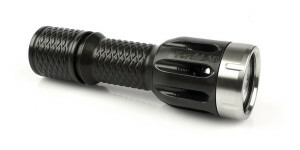 Designed in collaboration with Chris Costa of Costa Ludus as a “tactical tool that bridges the gap between flashlight and weapon-light,” the SwitchBack Backup allows the user to quickly deploy the flashlight for searching or single-hand shooting techniques, but then quickly reorient the light for use with a two-handed shooting grip. 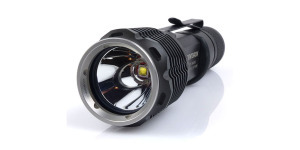 A separate version, the Costa SwitchBack Large, is designed for the current lineup of SureFire G and P series lights such as the G2X, 6PX, P2X Fury and P3X Fury. 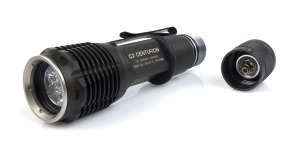 The SwitchBack Large is also compatible with many similarly sized lights from SureFire and other manufacturers. See the full review of the Costa SwitchBack Large for additional information about this product. The SwitchBack Backup used in this review was provided by Thyrm LLC. The SwitchBack Backup is made of lightweight but strong nylon in a matte black finish. A narrow lip on the inside of the SwitchBack Backup installs between the body and tailcap of the light ensuring the SwitchBack Backup cannot be pulled off without first removing the tailcap. The Costa Ludus Logo is prominently featured on one side. Installation consists of removing the tailcap, installing the provided O-ring and simply slipping the SwitchBack Backup over the tail threads of the light until it rests against the flashlight body. The additional O-ring provides friction between the SwitchBack Backup and the flashlight body to prevent the ring from spinning freely. With the SwitchBack Backup installed, both momentary modes operate normally but the tailcap cannot be rotated for constant-on operation. Since the body of the SwitchBack Backup covers almost the entire tailcap, a small opening is provided which can be used to hold the tailcap as it is threaded onto the body. The following video from Thyrm demonstrates the installation process on a SureFire EB1 Backup. Like with the SwitchBack Large, the SwitchBack Backup has two usages, first in the conventional overhand hold and secondly in a backhand hold for use in conjunction with a handgun. In the overhand hold, the tactical ring aids in retention and keeps the light properly positioned for use (P2X Fury shown). Alternatively the light can be quickly flipped into a back-hand hold allowing a two-handed grip on the weapon. 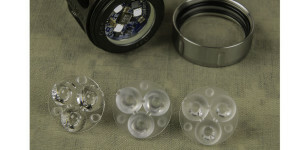 In this orientation the light is activated by pressing against the top of the ring which pushes the tailcap switch into the knuckle of the middle finger (P2X Fury shown). The technique is further explained in this video from Mil-Spec Monkey. The SwitchBack Backup is designed specifically for the tactical EB1T and EB2T versions of the SureFire Backup which have slimmer and/or longer tailcaps than any other E-series lights. The SwitchBack Backup is not compatible with the click switches on the EB1C or EB2C Backup flashlights. Installation and removal was a simple affair with both the EB1T and EB2T. On both lights the SwitchBack Backup was secure and remained in place when used with the provided O-ring. 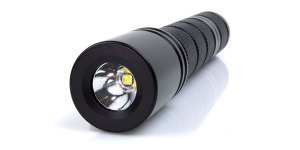 The SureFire Backup family of flashlights was designed for comfortable pocket carry and features very smooth designs and no knurling or other gripping surfaces. While this makes the lights easy to slip into and out of a pocket, they do not provide very much grip, particularly with wet or sweaty hands. This is especially an issue with the tactical models as activation of the high output mode requires a firm press on the tailcap switch. 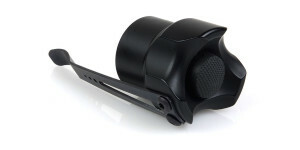 The SwitchBack Backup is comfortable to hold and provides a very solid grip when using the light in an overhand grip. The switch is perfectly positioned for use and operation is quite secure with no concerns about the light slipping in the hand. Transitioning to the backhand hold can be accomplished smoothly with only a little practice. My review sample of the SwitchBack Backup has found a permanent home on my tan EB2T as I really value the additional grip it provides. Although the SwitchBack Backup does take up a little additional space in my pocket, it has not been an issue or created any problems with comfort. One unexpected benefit is the EB2T seems to be less prone to accidental activation when pocket carried with the SwitchBack Backup in place. As with the SwitchBack Large, my first impressions of the SwitchBack Backup are all positive. Quite frankly, any owner of a SureFire EB1T or EB2T should give this product a look, even if they don’t plan to use their light for tactical purposes. The Costa SwitchBack is designed and manufactured in the United States. Visit the Thyrm website for more information or to purchase the Costa SwitchBack Backup. Posted in Flashlight Accessories, Flashlight Reviews, Other Products and tagged Flashlight Upgrades. Thank you for this new review, today, I received another Switchback “backup”. I thank deborah (from Thyrm LLC) for his kindness.